On Veteran’s Day I woke up later than I usually do. My girl had to work and the kids all had their own things going on. As I lay there in bed, I said to myself, "I should go fishing." The next question that comes to mind is always, "where?" For us here in northern California, the "where" can be a tough question. This is especially true for someone like myself who has a hard time with making up his mind when there are too many choices. Rather than think too much about it, I decided against my creek-down-the-way, which wasn't looking so fit this late in the year, and headed to a local park pond to see what might take a kebari or popper. I fished the pond for a couple hours with no sight of a fish. Frustrated, I reckoned I'd at least check out some of the sections of my creek that might have fish. When I got there, it was very low. In fact, it wasn't really a creek, but rather a series of small ponds. As I stepped to the first one, I watched as a number of fish ran for deeper water. "Trout tactics!" I said to myself, "I'm game." Having spooked the first pond thoroughly, I moved to the next very slowly. I hid behind a bush, flicked my Yamame just right for once and when the popper hit the water, the largemouth pictured hit back. To say the least, I was stoked. 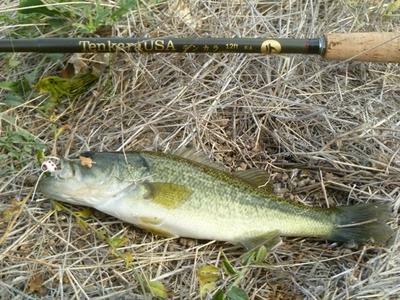 It had been months since I'd felt the wonderful shake of a tenkara rod. Having spooked another pond, I moved on. The next one had fish rising, but none for me. At the last and largest pond, I fish around it for a bit for no strikes, then both suddenly and surprisingly, a black crappie smashed my popper. 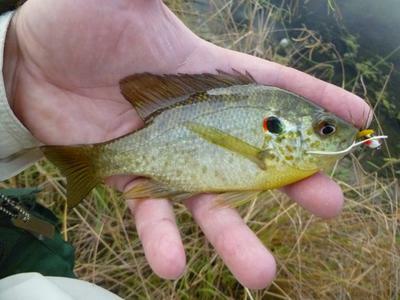 I knew there were crappie in the creek because I'd found one once before using a worm, but this guy was hangin’ out with friends and I spent the next hour or so in a ten yard section of the pond throwing them poppers and killer bugs and the like. All in all I landed 10, with four redear gills thrown in for good measure. At the end of the day, I reflected on whether or not the fishing could have been as fun had I chosen another "where." The answer was and is, "who the heck cares! That was a great day of fishing."